Light, as you may know, travels in the form of waves. When the waves pass through the opening of your telescope, the disruption causes the waves to run into each other. Where the crossed waves match peak to peak and trough to trough, the waves reinforce each other and get bright. Where the peaks of one wave hit the troughs of the other, they cancel each other out and get dark. The resulting dark and light pattern is called an interference pattern. Waves, coming in from the left, and passing through a hole. Notice how the waves that go straight through the hole are brighter, and as the angle from the centerline goes up or down, you can see the waves get alternately darker and brighter. That's the interference pattern. The hole represents the opening of your telescope. So now in the case of your telescope the circular opening of the telescope creates a circular interference pattern. Because of this interference pattern, when you make an image of a star, it does NOT focus to a perfect point. Rather, it focuses to a disk, and if you set your telescope for high magnification and examine the image carefully, you can see that there is a disk with faint rings around it -- this is the interference pattern that is caused by the circular aperture of your telescope. In fact, this is a special interference pattern and it has a special name -- the "Airy disk" -- named after Sir George Biddell Airy, an English astronomer who described this pattern mathematically in 1834. Idealized picture of Airy disk Two close stars appear as two Airy disks. When the two stars start getting as close together as the radius of the Airy disk, we start to have trouble telling them apart. When the two stars are closer together than the radius of the Airy disk, we can no longer tell them apart. How a star's Airy disk looks in a telescope (due to atmospheric disturbance) Epsilon Boötis, a very close double star at 2.8 arc-seconds in the constellation Boötes, is split here at high power, revealing the beauty of this blue and yellow pair, and also clearly showing the diffraction rings, very much as they appear in the eyepiece. This excellent photo courtesy of Damian Peach. The bending of light which causes this interference pattern is known as "diffraction", and the Airy disk is also known as the diffraction pattern of the scope. where λ is the wavelength of light, which happens to be 550x10-9m for green light, and Dscope is the diameter of the objective in meters (so really the same thing as DO, but to emphasize this is in meters, not millimeters). With regard to your telescope, what is important in this equation is that the size of the Airy disk depends on the diameter of the objective ONLY, and as the diameter of the objective gets bigger, the Airy disk gets smaller. This means as the diameter of your scope gets bigger, you can see smaller and smaller detail -- or equivalently, you can split stars that are closer together. Conversely, this means that there is a limit to the detail you can see with your scope. That limit is dictated ENTIRELY by the diameter of the scope, and it is due to the diffraction effects caused by the scope opening. For this reason, the radius of the Airy disk, as calculated above, is known as the "diffraction limit". Note then that when you can see the rings of the Airy Disk, this signals to you that you are operating at the limit of the scope's power to resolve detail. Start by replacing λ with 550×10-9 which is the wavelength of green light, sitting at the center of the visible range, so 1.22×λ/DO = 670×10-9 radians ÷ scope diameter in meters. Multiply by 1000 to get 670×10-6 radians ÷ scope diameter in mm. Multiply by 57.3 to get 38.4×10-3 degrees ÷ scope diameter in mm. Multiply by 3600 to get 138.4 arc-sec ÷ scope diameter in mm. Note that the Dawes Limit is smaller than this, meaning a good observer can beat what the diffraction limit predicts. The diffraction limit equation gives an answer in radians, whereas most dimensions in astronomy are given in degrees, minutes, or seconds of arc. Also because of various other factors, the actual limit of detail that an observer can see does not match exactly to the diffraction limit. Interestingly, a skilled observer can do better than the diffraction formula would suggest. 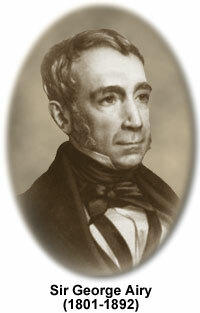 In 1867, William Rutter Dawes determined the practical limit on resolving power for a telescope, known as the Dawes limit. Dawes expressed this as the closest that two stars could be together in the sky and still be seen as two stars. 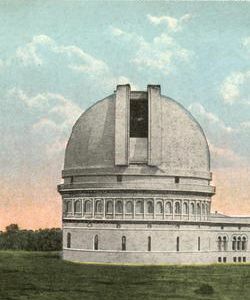 The Dawes Limit is 4.56 seconds of arc, divided by the telescope aperture in inches. We can multiply the Dawes limit by 25.4 to convert to the metric system (in mm), which gets you to 115.8, and then round to a number that is more convenient when doing the math in your head , and we get the resolving power of the scope, PR in seconds of arc. You're not just looking through your telescope at the stars, you're also looking through air -- literally tons of air. 50 miles of it straight up, and hundreds of miles when you're looking close to the horizon. That air is usually in motion, and the shifting masses of air at different temperatures cause the light to deflect. The deflection is small and subtle, but when you are looking at high magnification, it seriously affects the amount of detail you are able to see. Atmospheric conditions for astronomical viewing are talked about in terms of "transparency" and "seeing". The term "transparency" refers to how clear the sky appears to be. It is measured in terms of the faintest stars you can see by eye. So for example in my neighborhood it is not unusual to have a magnitude 3 night -- you can't even see stars that are magnitude 4 -- but on a really good night you can just see magnitude 5 stars. Transparency is determined by the combination of lights that brighten the sky and water vapor or dust in the air to catch the light and obscure faint stars and deep sky objects. The peculiar term "seeing" refers to how steady the air is. This directly affects the detail that you can resolve. The more turbulent the air, the worse the resolution. A typical sky only permits 2-3 arc-seconds of resolution, whereas a good sky, at sea level, will permit closer to 1 arc-second. A superb sky at high altitude, could possibly provide 0.4 arc-second seeing. Let's translate that into terms of magnification. As discussed on the Maximum Magnification page, the resolving power of your eye, assuming 20/20 vision, is 120 arc-seconds. If the atmosphere will permit 1 arc-second resolution, how much do I need to magnify that to make it 120 arc-seconds? By what factor do I multiply 1 in order to get 120? Take your time... that's right, 120. What that really means to us is that as you increase magnification above 120, your eye starts to see the blurring the atmosphere introduces. Remember, this is when we have good atmospheric seeing, on some nights the image can start to get blurred as you get above a magnification of 60 or so. Then we can certainly say that as you get to the range of magnification of 150-200, the atmosphere will limit what you can resolve. Any further increase in magnification will only give you a closer more detailed look at exactly how the atmosphere is blurring and distorting the image. Bearing in mind the fact that the maximum magnification of a scope is simply the diameter of the scope in millimeters, we can very quickly determine what scopes will be limited by the atmosphere. If we consider the upper limit imposed by the atmosphere to be a magnification of 200, then 200mm translates into an 8 inch scope. So then if you're wondering why anyone would get a scope larger than, say, 8 inches... the answer is that resolving power is only part of the picture. Image brightness is also driven primarily by the scope diameter, as you can see in the pages on Magnitude Gain and on Surface Brightness. 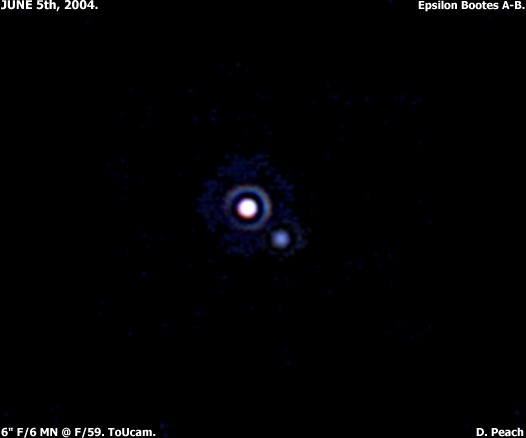 Epsilon Lyrae is a famous star, known as "the Double Double", in the constellation Lyra. This star shows as a double star when you look at it in binoculars. But then if you look at it in a telescope, and if the telescope is big enough, you can see that each of the two stars of this double is also a double! So here's the question: does my 90mm, f/13.9 Meade ETX telescope have the resolving power to split the Double Double? First we look up the Double Double, or Epsilon Lyrae, in a reference like Burnham's Celestial Handbook or find it on the web on a page like the one by Professor James Kaler. Prof. Kaler's page tells us that one pair is 2.8 arc-seconds apart, the other is 2.2, consistent with what Burnham's handbook says. So I only need to know the diameter of the objective, or DO, for my ETX to figure this one out. Since, as I noted earlier, DO = 90 mm, then PR = 120/90 = 1.33 seconds of arc. Since that is smaller than the separation of the components of Epsilon Lyrae, I should be able to split the Double Double with my scope. I can report to you that in fact I have been able to split the Double Double with my ETX, which speaks well of the optics on my ETX. I can also report that it requires good atmospheric conditions. That's because, as noted above, the atmosphere will limit you to 1 second of arc on a good night, and worse than that on most nights. So while my ETX can split the Double Double, it can't do it every night. But then neither can the bigger scopes -- we all need a clear, steady sky to bag the Double Double. Notice how the two pairs align at right angles to each other -- one pair aligns North-South, and the other aligns East-West. It's very cool to get this in the eyepiece. These four stars form a set that is a true double-double star, formed from the same nebula, which was spinning so fast it first spun apart into two protostars. They in turn each spun themselves apart into two stars. Today, the two spinning pairs are still orbiting each other. 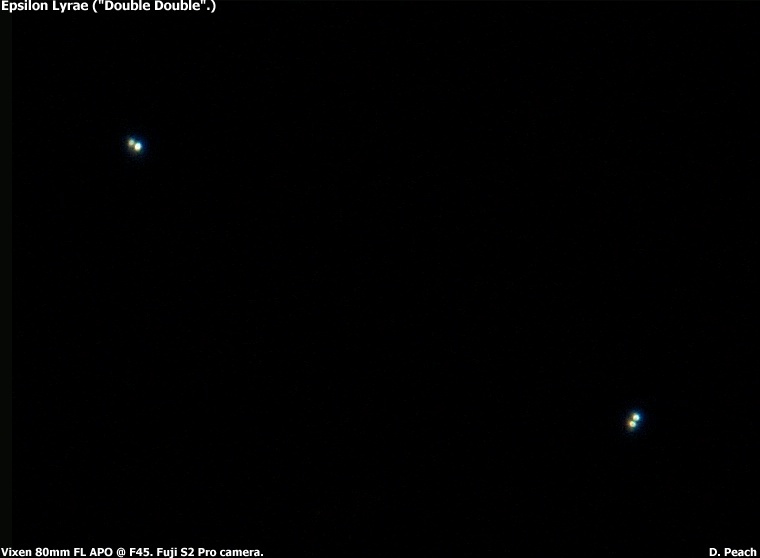 This exceptionally clear photo of the Double Double courtesy of Damian Peach.